The weather. We are all preoccupied with it. It is our favourite topic. It never fails to come up, usually at the beginning or the end of a conversation. Indeed, it is sometimes the only topic that comes up. 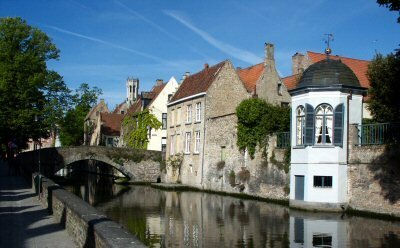 We are usually not very informed about it, and a lively discussion about the subject is rare, but noone likes painful silences. Better talk about the weather. Some people talk about the weather for a living. They make whole careers out of it, are famous TV personalities. They host talkshows where the subject is always the weather, and the guests all belong to the demographic known as "the elements". They call these shows weather bulletins. Our preoccupation is entirely one sided: the weather doesn't care one jot about us or our concerns in return. It is indifferent and indiscriminate. It will rain on fairytale weddings and shine on skinhead parades. It will storm at open air concerts and be calm during ocean races. It isn't fair, and it isn't considerate. Weather isn't good or bad. Those are subjective labels, and the weather is anything but subjective: it just is. As I stood contemplating this, I could feel the next trickle of cold water running down my neck. The plastic bag I was using to try to shield myself from the pouring rain hadn't been made for this purpose and was letting me know that most emphatically. Three hours we had been standing in line outside the Amsterdam ArenA, waiting to get in to see U2 (see previous post). There hadn't been a cloud in sight, and the sun had been burning fiercely down on us. But as the time for the doors to finally open approached, so did ominous dark clouds, bringing copious amounts of rain. And so, as the next batch of rain drops found a hole in my plastic defense, I was struck by what in very select company is known as a Mike Oldfield Moment. Mike Oldfield is an English multi-instrumentalist who is most well known for his debut album Tubular Bells, which came out in 1973 on the then little known Virgin Records label. It was a true sleeper hit: it made little impact on its initial release, but after it was featured in the high profile film The Exorcist, it skyrocketed to the top of the charts, launching Richard Branson's Virgin empire along the way. None of Oldfield's subsequent albums have ever matched its success, let alone surpassed it. 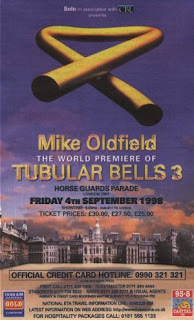 In the late eighties, Oldfield was beginning to chafe under his contract with Virgin Records, who were insisting that he call his next album Tubular Bells 2. 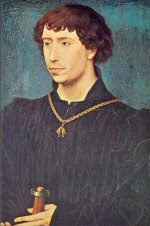 It hadn't escaped their notice that the popularity of Oldfield's albums had been declining steadily over the last few years, and they theorized that naming a new album after his most succesful one would perhaps buck the trend. Oldfield was having none of it, however, and after releasing two more albums under names that resembled anything but Tubular Bells, he acrimoniously left Virgin. As a last jab at Virgin, the first thing he did at his new label, was release an album called Tubular Bells II. The third sibling, Tubular Bells III, saw the light of day in 1998, and this is where our story begins. 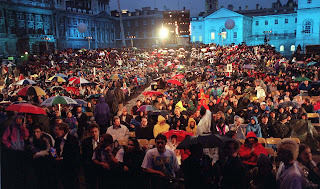 The album was to have its world premiere on September 4th at Horse Guards Parade, which is a large parade ground off Whitehall in central London. Yours truly and two friends bought tickets for the event and departed for a quick visit across the channel. English weather is touch and go at best, and pretty much ignores the seasons when it comes to the amount of rain or sunshine one is to expect at any time of the year: I have had washed away July's, and sun drenched Octobers. As it turned out, September 4th, 1998 was a beautiful day in London. Clear blue skies, the sun shining benevolently down on us. We enjoyed the sights and as evening approached we made our way to Horse Guards Parade in high spirits. No sooner were we standing in line before the entrance, though, than dark clouds started to gather at the horizon and began moving our way at an alarming speed. The first drops of rain started falling by the time we passed through the entrance. As we were trying to locate our seats, which were somewhere at the back of the grounds, this turned into a steady drizzle. If that wasn't a downer, then the fact that our seats were simply not there definitely was. The seating area that they were supposed to be in lacked one row: ours. We checked with an attendant, and he informed us that the entire row had been taken out to make more room for cameras. The attendant told us not to worry and gave us replacement tickets, assuring us that these seats were much better than the ones we had before. He wasn't exaggerating, because after we installed ourselves on our new seats, we realized that we were now seated in the grandstand, right in front of the stage with the best view in the house. This was the area for the VIPs and guests, Mike Oldfield's three young daughters among them, who were in the row directly behind us! So while we weren't exactly basking in the sun - it had by now really begun pouring down - we were at least basking in our new found glory. shoelaces in row 8, to the right of the girl in the yellow raincoat. About the concert itself it is best not to say too much. 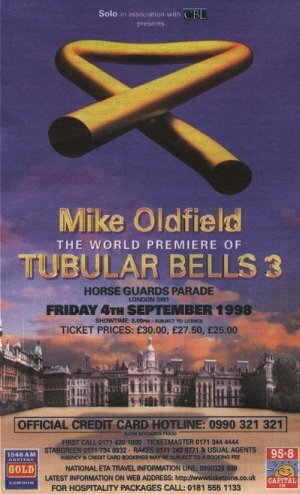 Tubular Bells III is not exactly Oldfield's best album, and tonight he played it in its entirety. And out of a back catalogue which spanned the better part of twenty five years at the time, the only encores he managed to come up with were repeat performances of two songs already played that night. In the end the highlight of the concert turned out to be the fifteen minute excerpt of the first Tubular Bells album that was played as the opener. This is what went through my mind as I was trying to stand very still below my plastic bag. The Amsterdam ArenA is no Horse Guards Parade, though. It has a roof, which does a pretty good job of keeping the rain out. We had standing places, so there was no danger of someone removing our row to make room for some piece of equipment. And finally, U2 is no Mike Oldfield. Don't get me wrong: I'm a big Oldfield fan, but it is unlikely I'll ever go out of my way to attend a concert of his again. Next time, I'm aiming for another U2 Moment!